The UT police arrested 23 persons for bursting crackers beyond 10 pm on Diwali night. They were arrested under Section 188 (disobedience to order duly promulgated by public servant) of the Indian Penal Code (IPC). Following the direction of the Supreme Court, the bursting of firecrackers was allowed in the city between 8 pm and 10 pm. The Deputy Commissioner, UT, had issued an order under Section 144 of the CrPC in this connection. However, many residents started off late and continued bursting firecrackers till 12 midnight. Cops in PCR vehicles patrolling the city warned residents against bursting crackers after 10 pm. The UT police had deployed force in strength to keep a check on the violation of the SC order. The police said no untoward incident was reported from the city. 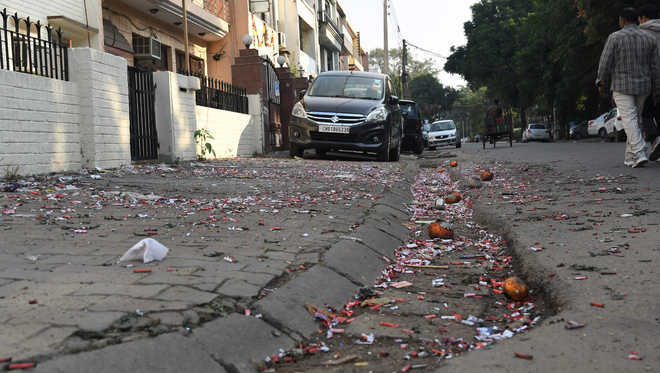 A total of 38 cases were registered between November 5 and 8 in connection with bursting or sale of crackers. In 33 cases registered under Section 188 of the IPC, as many as 34 persons were arrested for not adhering to the time limits for bursting firecrackers. Five persons were arrested between November 5 and 7 for selling firecrackers without permit or licence. Last year, the police had registered 11 cases against unidentified persons for bursting crackers after the permissible period. The Punjab and Haryana High Court had last year directed that crackers could be burnt only between 6.30 pm to 9.30 pm on Diwali night.